Below is great picture from a TulsaWorld article of the continual losses by American Airlines parent AMR Corp (AMR). In good years, AMR makes a decent profit. In bad years, AMR has crushing losses. Even worse is the fact the losing years outweighed the good years 8 to 3 accumulating in a net loss of roughly $10.5B. How has this company even survived? AMR recently made the historic aircraft order that some say was needed to survive. Sure it makes them more competitive, more appealing to customers, but how are they going to pay for the planes. Per my recent article, still see the airplane lessors as the winners. Companies like AerCap Leasing (AER) will continue to benefit from major airlines that need new fuel efficient planes to compete, but can't afford to buy them. Retail gas prices remain very elevated as seen in the chart below from Chartfacts.com. Beginning around May when oil prices plunged, gas prices remained relatively steady. Only falling as oil continued dropping below $100. According to the chart, the average price of gas needs to fall $0.30 to equal the fall in oil prices. Supposedly a lot of the price difference is caused by the price of Brent crude being higher than the Nymex/WTI quoted version. The main culprit for the price difference is the congestion and glut in Cushing, OK. Evidently they've built more pipelines coming into Cushing than ones leaving. Nice! Basically America has increased oil production to such an extent that now consumers aren't even getting the advantages. Brilliant! So while Congress is busy debating the debt ceiling our energy policy continues to be less than desirable. Incredible negative action in Manitowoc (MTW) after earnings Tuesday night. The stock dropped from $16 on Monday to $13 around the opening on Friday. Of course, the market was very weak contributing to the drop, but it was amazing to see the level of selloff in this particular stock. MTW is a leading crane maker and competes with Terex (TEX) among other companies. What really amazes this investor is that TEX had recently reported strong sales and weak profits leading any skilled investor to know the playbook for MTW. 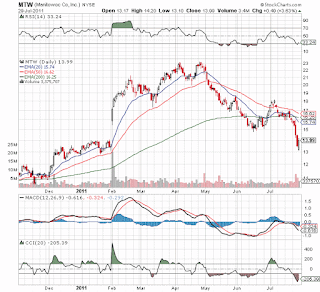 In fact, MTW actually reported stronger cranes numbers than TEX making any serious investor dizzy seeing MTW plummet. Luckily Stone Fox Capital unloaded MTW in the $15.8x range last Friday noting the stock was technically falling apart. 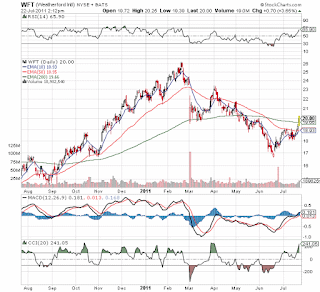 Not to mention it had a gap around $14 in the charts suggesting the stock might fall substantially. Unfortunately we weren't able to return to the position in the low $13s this morning. The stock will be on are radar next week though. his is the third in a series on stocks with the fastest estimated earnings growth in 2012. The first two articles focused on Take Two Interactive(TTWO) with estimates expected to grow over 400% and Patriot Coal(PCX) with numbers expected to nearly triple. The third fastest growing company is Manitowoc (MTW) with earnings expected to grow over 220%. Since we recently wrote a report on the crane sector which included MTW and the number six fastest grower in Terex (TEX), this article will focus on the next two stocks on the SteetAuthority list. Accuride (ACW) and Meritor (MTOR) supply parts to the automobile industry. Both companies were forecasted to grow earnings by roughly 220% next year. Likely both companies are relatively unknown by the investment community, which is one of the major benefits of such analysis. Focusing on just the names that hit the media outlets can cause investors to ignore under the radar investment ideas. The buyout of Puda Coal (PUDA) is becoming increasingly likely considering the Chairman of the Board submitted a draft merger agreement last week. Though slightly delayed from the expectations of a submission in June, it still backs up his intent to follow through with the proposal from April 29. The delay also isn't too surprising considering the ongoing investigation into his supposed illegal transfers of company assets. Naturally the details of the merger agreement are more important than just the submission. No guarantee exists that the terms are agreeable. Or whether the price matches the desires of at least some shareholders that think $12 is too low. Will the special committee and BOD be able to negotiate a higher price? It would seem a difficult pill for most shareholders to swallow if Ming Zhao was able to cause the fear and parlay that into a cheap buyout. Wednesday morning, AMR Corp (AMR), the parent company of American Airlines, announced the greatly anticipated orders for 460 planes and options for 465 more. While the market focused on the shift of a US airline from a Boeing (BA)-only focus to Airbus, everybody seems to have missed the announcement last week that American Airlines was going to sell/lease back up to 35 Boeing planes with AerCap Holdings (AER). Clearly it's justified to focus on not only the historical size of the order from American (some estimates are close to $40B) but also the shift in plane manufacturers. While the analysts call the order a split, the additional options clearly favor Airbus in a major way. If all the options are taken, Airbus will receive around 65% of the orders. Considering that fact, the media was generous to BA executives to only focus on a split of the orders instead of a major shift towards Airbus. After the close Tuesday night, Riverbed Tech (RVBD) reported inline earnings and revenues that were slightly lower than estimates. The stock was crushed in after hours as traders overreacted to the revenue disappointment and ignored the record margins. The encouraging news was RVBD reporting record gross and operating margins. This means that RVBD wasn't cutting prices to just make the estimates. If anything, it backs up the claim that weakness in EMEA was as much about closing deals as competition. Other good news was that it used a part of its $611M cash hoard to invest in two new companies, Aptimize and Zeus Tech, that will be accretive in 2012. Also, US product sales grew by 50% and sales would've met the midpoint of analysts estimates if it had been able to ship the surge of orders in the last few days. Disclosure: Long RVBD in client and personal accounts. Please review the disclaimer page for more details. Great news for one of the weakest stocks in our Net Payout Yield model. Express Scripts (ESRX) agreed to purchase MedcoHealth Solutions (MHS) for $29B. The deal gives MHS shareholders $71.36 based on the closing prices on 7/20 amounting to $28.8 in cash and 0.81 shares of ESRX. Considering ESRX is up 6% today the value of the deal got much more attractive now worth nearly $74. Oddly though, MHS has only traded up to around $65 most of the day. The nearly $9 gap suggests the market is concerned about the deal not completing. Anti-trust issues could pop up as the combined company will be a nearly $60B behemoth in the pharmacy benefits sector. Interestingly though ESRX shareholders are excited enough about the deal to send their shares much higher. Maybe investors just aren't that good with math and are missing the share rise of ESRX and subsequent increase in the value to MHS shares in the deal. Last week we started a series on the companies with fastest growing earnings next year. The first article was written about Take Two Interactive (TTWO) that topped the list with earnings expected to grow by roughly 463%. The second fastest grower is Patriot Coal (PCX). While TTWO doesn't impress us as a stock with sustainable earnings momentum, PCX on the other hand has some growth initiatives combined with expiring legacy contracts that will provide much higher margins once rolled over. In fact, the two coal supply agreements that expire will add a whopping $150M in EBITDA by 2013. Please read the full article at SeekingAlpha.com. Disclosure: Long ANR for client and personal accounts. This information should not be construed as investment. Please review the disclaimer page. 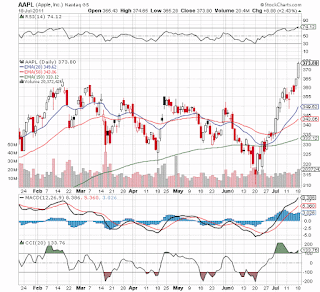 Apple (AAPL) hit an all time high today over $374. Ok, so its not the beginning since the stock was only $80 during the great recession and much lower in the early 2000s. Still AAPL appears to have plenty of room to run considering the forward PE based on typically overly low analyst estimates is below 13. JPMorgan (JPM) made a call to buy August $365 call options to position for potential upside ahead of the company's quarterly earnings. A very unusual call and one that concerns us that AAPL will see a pullback after the earnings report. The stock has already soared from $310 to current $373 price in less than a month. Though it did breakout of stiff resistance in the $350-360 range suggesting major upside possibly to hit the JPM target of $450. The high 2012 earnings estimate is $33.30. A modest 20 PE would suggest a $666 stock price. Hmm, maybe that will the signal to sell. Whew! That is a complex header. According to InvestmentNews investors fled actively managed US equity funds at the same level as the March 2009 generational low. Naturally the market has doubled since then so the percentage of the total market isn't comparable, but it does highlight the fear factor in the market. In a way, this backs up the market selling cyclicals very hard and consumer staples rallying. What was really staggering is that Fairholme Fund (FAIRX) had outflows of $1B. After being the manager of the decade, investors were very quick to flee Bruce Berkowitz in June. What a tough industry! Maybe I should reconsider. After reading an article from StreetAuthority about companies with the fastest growing earnings, it got me looking into the companies not already owned in Stone Fox Capital's Opportunistic models. The companies expecting huge earnings growth next year appear to be overlooked, but one should use the list as a starting point for research. The report is only as good as the underlying data. Not to mention that analyst estimates typically aren't up to date so reports can easily give false positives. 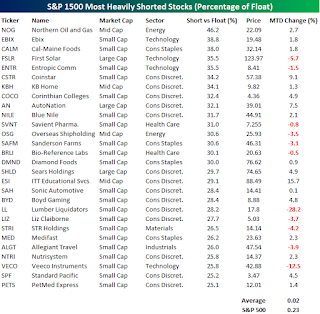 Great list of the most heavily shorted stocks by Bespoke Investment. Amazed to see that 3 stocks in our Opportunistic models appear on this list. Sears Holdings (SHLD), Savient Pharma (SVNT), and Liz Claiborne (LIZ) all have roughly 30% of the outstanding float short. Hopefully one day these short levels will lead to a massive short squeeze. SHLD continues to buy back stock meaning that the float will continue to shrink likely leading to higher and higher percentages. What the shorts don't seem to understand is that SHLD while a troubled retail operation has a ton of valuable assets and a solid balance sheet. The short story just doesn't add up. According to a Gleacher analyst, Cisco Systems (CSCO) is expected tocut about 5,000 jobs in August. That would be a massive 7% workforce reduction for a company with roughly 73,000 employees worldwide. According to the analyst, that reduction would be similar to large cuts the company took back in 2001 and 2002. Clearly those cuts were successful, or at the very least didn't preclude CSCO from being a dominant tech company in the 2000s. Stone Fox Capital is now putting more emphasis on a Facebook presence. They make it easy to post quick links to internet articles of interest or to link to articles impacting. Please like us on Facebook if you have any interest in following. Or let us know if you have any feedback on using social media tools. This is the sixth and final article in a series focusing on the plights of certain sectors since they peaked prior to the financial crisis in 2008. All of the sectors covered have struggled mightily to recover to pre-crisis levels, while other stocks and sectors have surged on to new highs. So far the series has covered Steel Producers, Engineering & Construction,Women's Apparel, Life Insurance and Large-Cap Tech. Copper remains on a hot streak and backs up our theory that global markets remain on a strong growth plan. It also highlights the issue with copper supply. Read just about any copper article on the internet and it'll summarize the difficulty that large copper mines are having with keeping production up. In many cases the production levels are down 10% from last year. So in essence demand growth remains strong and supply growth remains constrained. The media focuses on peak oil, but maybe peak copper should be a bigger focus. After all oil is still being found at a rapid pace in deepwater locations and shale formations. Oil production in the US is increasing for the first time in decades and shale gas is making the possibility of moving truck fleets to LNG a real option. Hence reducing the demand for gasoline from oil.